On the campaign trail, Donald Trump told America we would be sick and tired under his presidency — because of all the winning. He was half right. "We’re going to win so much, you’re going to be so sick and tired of winning, you’re going to come to me and go 'Please, please, we can’t win anymore.'" That was Donald Trump in May 2016, on the campaign trail, bright-eyed and inanely pompous. "And I’m going to say 'I’m sorry, but we’re going to keep winning, winning, winning,'" he continued, with the audacious confidence of a man who thinks he can shape the future through the sheer force of his egotism. But Past Trump's clairvoyance had its limits; he obviously couldn't see the dismal, ever-darkening polling numbers that would dog every day of his presidency. 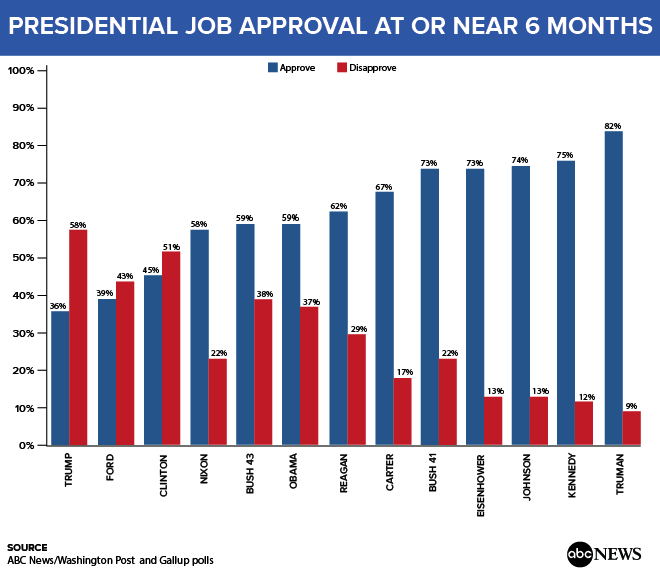 The latest proof of his losing season: Trump has the lowest six-month approval ratings of any modern president, going back through 70 years of polling data. A new ABC News/Washington Post poll shows that only 36 percent of Americans approve of Trump's job performance. ABC News notes that is a six-point decrease from his 100-day numbers, and one that is approached only by Gerald Ford, who reached 39 percent in 1975. But then, these basement-level numbers are nothing new for Trump. Humiliating polls have been a constant of his presidency — even before he officially assumed office. And this new polling shows Americans are disgusted with Trump for a variety of self-inflicted reasons. The Russia scandal looms large: 63 percent said it was "inappropriate for Trump’s son, son-in-law and campaign manager to have met with a Russian lawyer during the campaign," and six in ten think Russia "tried to influence the campaign." Even more stinging, of those who believe so, 67 percent believe the Trump team was in on it. And on a broader international scale, two-thirds of respondents don't trust Trump to competently negotiate with world leaders. 48 percent say the United States' leadership on the world stage has weakened under Trump; merely 27 percent feel it is stronger. And as the Republican Congressional leadership continues to work themselves into legislative pretzels in their attempts to pass their health care repeal bill, the new poll shows that Americans prefer the Affordable Care Act over the GOP's plan by a margin of 50 to 24 percent. And it's not only those on the left who want to retain and improve Obamacare, rather than replace it with ersatz "care." Trump's promise that we would "win so much" is yet another he couldn't keep. Instead, Trump continues to be the same loser he has always been. Little wonder that much of the nation misses his predecessor so much — a man who really did win, and to whom Trump could only dream of measuring up. Next articleTop Intel Dem: Russia meeting is "clear evidence" of collusion, path to "serious crime"